Presented by Opera Australia in association with Salzburg Festival, The Metropolitan Opera and The Canadian Opera Company. 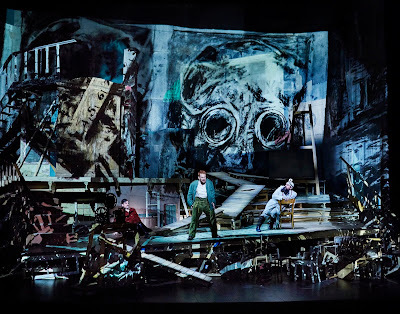 William Kentridge’s stunning interpretation of Alban Berg’s 1925 expressionist opera Wozzeck, with his desolate charcoal animations superimposed over a huge rough wooden setting, caused a sensation when it was first seen at the Salzburg Festival in 2018. It’s not difficult to see why. 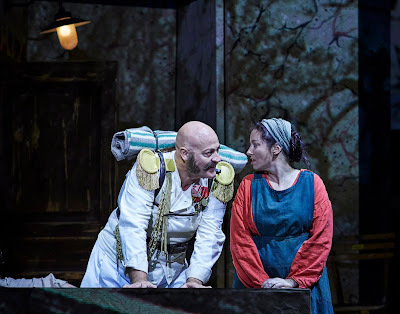 Based on George Buchner’s 1836 play Woyzeck about a real-life soldier, who, traumatized by war and humiliated by his petty social superiors, murders his girlfriend, before committing suicide, the opera has obvious contemporary connotations. Berg had served in the Austro-Hungarian Army during World War 1, and then in the war ministry during World War 1, and his opera references the scars he himself endured. Kentridge has also located his version in the Great War era, with his charcoal drawings of war machinery, aircraft crashing, mid-air explosions, gas masks and severed heads projected on to the stage and across the set, their graininess and smoky texture effectively suggesting the traumatized state of Wozzeck’s mind. 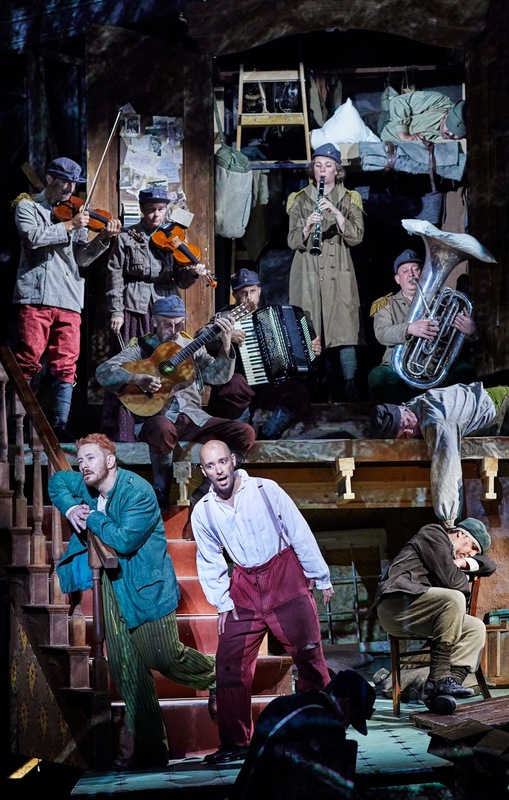 The 90-minute opera is performed straight through without an interval. 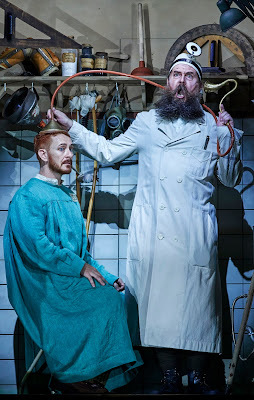 It’s vibrant, atonal music and psychological violence vividly captures the toll on Wozzeck, his humiliation by his army captain and his doctor’s medical experiments, then finally, his desolation at the discovery that his girlfriend, Marie, is being unfaithful. Kentridge’s concept and direction is masterly. Ghostly characters and images emerge unexpectedly from the deep shadows. Occasionally one will re-arrange a prop or reposition a piece of scenery before disappearing back into the gloom. As Wozzeck, Michael Honeyman is riveting, both vocally and dramatically, drawing on the complexities of Berg’s extraordinary score to capture the progressive deterioration of his character’s mental state. Lorina Gore is equally astonishing as his unfaithful girlfriend, Marie, conquering the demands of a score which requires her to draw on her full vocal range, from guttural chest sounds to stratospheric coloratura. John Daszak as the brutish Drum-major who seduces Marie, John Longmuir as the heartless Captain who humiliates Wozzeck, and Richard Anderson as the doctor who pays Wozzeck for the use of his body for medical experiments, all offer memorable performances, as does Dominica Matthews as the villager, Margaret, who manages to provide the only light relief in an otherwise grim production. Atonal music is the type beloved of comedians when satirizing opera, but when heard in context and performed, as on this occasion, by skillful singers and musicians who understand it, it becomes a potent expression of emotions and feelings difficult to access otherwise, and when matched with astonishing visual effects, particularly in the final section of the opera, with the full company and orchestra masterfully marshalled by maestro Andrea Molino, the effect is almost overwhelming. This is a production that will live long in the memory of all who experience it, and certainly one that no opera lover should miss. P.S. If you didn’t buy one of the excellent souvenir programs for this production, you many have missed the disappointing announcement that, due to declining sales, Opera Australia will cease producing these programs from June this year. Instead it will provide a small free program, which will include a cast list, synopsis and information about the opera. Opera Australia attracts visitors from all around the world, eager to experience their productions in the Sydney Opera House. 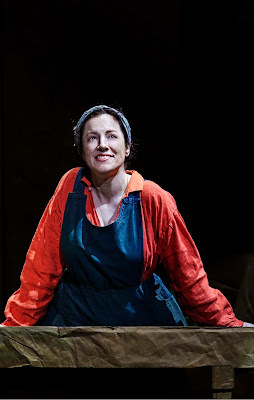 Apart from the valuable information they contain, about the artists performing in the production, about the company and those who support it, these programs become cherished souvenirs of a memorable, sometimes only, opera house experience. It seems a shame that they will no longer be available.